I created this tabletop vignette for the kitchen island at our Wine Country home. Using a little "organic" here and there, I mixed it up with a little French Bistro and Industrial! Across from the island is this cabinet that both serves as storage for our dishes, but also a place for me to create an overall composition of my collection of Bistro dishes and glassware. I love the clean look. I look forward to showing more of my kitchen in the future! 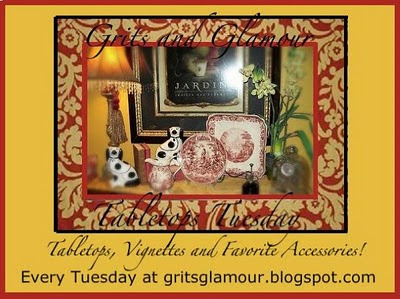 I'm joining Barb at Grits and Glamour for her first "Tabletop Tuesday" party. Be sure to visit her blog and see other tabletops, vignettes and accessories. I'm also joining Tam for the "Three or More - Tuesday" blog party at The Gypsy's Corner. Love your vignette...all of the different elements are wonderful!!! LOVE your kitchen island "VIGNETTE"...looks outstanding! Hope you have a FUN Tuesday! Your kitchen island is displayed so beautifully. I love that tall iron piece that's holding your fruit. Thanks for sharing. You have done a lovely job on you vignette but with your blog name you had better. Lol. When your bulbs open I'll bet the scent will be beautiful. You are lucky to have so much storage. This is such a practical yet beautiful set of cupboards. I absolutely love this vignette! I can't wait to see more of your kitchen. The cabinet is fabulous. You have a beautiful kitchen. Love your collection of dishes. Oh my Gosh!!! LOVE this!! LOVE IT!! I want to see more of your kitchen NOW!! Thank you so much for leaving me a comment, cos' it led me to you! I am a follower, and I will be back girl! What a pretty vignette. Love those cabinets!! terrific post. love your vignette and wonderful collection of treasures in your display. I love, love, love your vignette on the kitchen island. As well as the display of your bistro dishes in the glass cabinets. Everything is fabulicious!!! Oh Lord, someday please let me have a cabinet like this! I just love it and so much room! Fantastic! Love it and looking forward to more! I particularly love the pottery with words on it. Is it English? I love this vignette. Playing in the kitchen is one of my favorite activities. Your home is lovely! Great job and I love your cabinetry/dishes! Wow. LOVE your kitchen island vignette...great job! What a lovely vignette. Simple, understated, but yet very put together and pleasing to the eye. Pretty, pretty! I love it!